Two of our fave young ladies were reunited and we all couldn’t be any happier. The outstanding Lilimar and the marvelous Galilea La Salvia are both known for being two incredibly talented actresses who also happen to be the greatest BFFs. We always love seeing them together – whether they are slaying some photo-shoots, filming some awesome and super fun-to-watch YouTube videos, or even having a blast at an event. Lilimar and Galilea La Salvia both looked so stunning at the Spirit Talent Competition that was held on January 28, 2017 in Miami, Florida. Lilimar looked beautiful hosting the event and rocking a black dress embellished with teal colored gems and Galilea La Salvia looked fabulous wearing blue pants and a fantastic, graphic tee. These ladies always look oh, so stylish! It looks like these magnificent ladies had a brilliant time at the event! 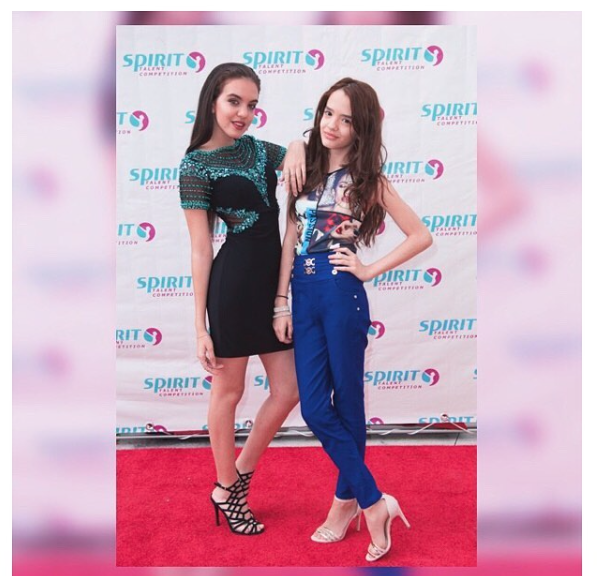 Check out more photos below of Lilimar and Galilea La Salvia at the Spirit Talent Competition! Previous Article: We Can’t Help Ourselves From Listening To Jake Miller And Cade’s New Song “Can’t Help Myself” On Constant Repeat! Next Article: DJ Phenomenon Martin Garrix Released His Incredible, New Song “Scared To Be Lonely” With Dua Lipa!